In an attempt to undo the growing feeling that ecumenism is paralyzed, Benedict XVI chose the date of the 10th anniversary of a joint declaration between Catholics and Protestants on the doctrine of justification to visit the Christkirche [Church of Christ], the Lutheran temple of the German community in Rome. The final draft of that document on justification was penned by then-Cardinal Ratzinger. Its content is a virtual denial of the conclusions of the Council of Trent on justification (see here and here). That Ratzinger was the document's author has not been mentioned to avoid the impression that the Pope is celebrating his own work. In visiting this heretical center, Benedict follows in the footsteps of John Paul II, who went to the same Protestant temple in 1983 as part of the commemorations of the 500th anniversary of Luther's birth. There is significant symbolism in the action of a Pope, head of the Catholic Church, who goes to a place that blatantly denies the Papacy and brazenly protests against the Catholic Church. By his action and words seeking unity with the followers of that false religion Benedict XVI implicitly asserts the intent to change the Papacy and reform the Church to please the Protestants. The content of the two homilies was quite bland. The only interesting points were that pastor Jens Martin Kruse stressed the "Pope's deep familiarity with Lutheran theology and spirituality," and Benedict had to reaffirm that ecumenism is not dead. 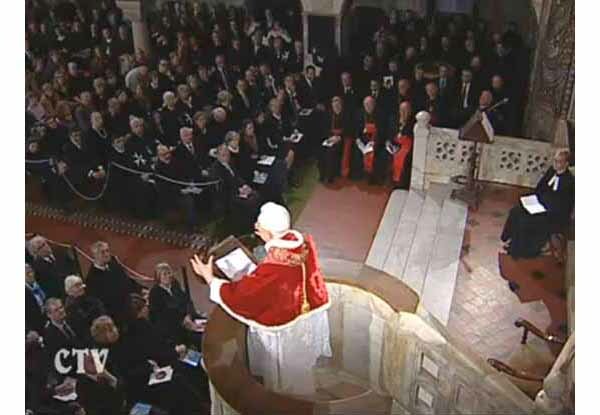 Above, you see the Pope delivering his words to the Protestants of Rome on March 14, 2010. 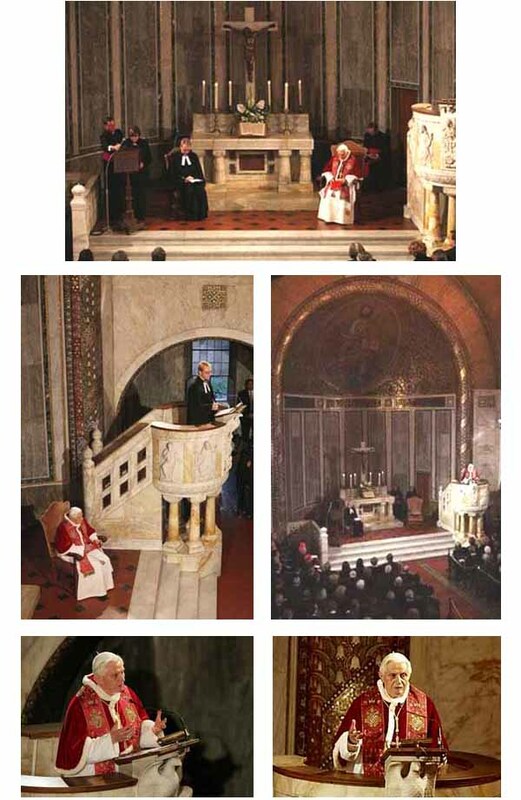 Below first row, Benedict arrives at the temple, second row, walks to the center of the building, and third row, bows to an empty altar without the Blessed Sacrament. In the fourth row, he listens to a welcoming speech by a woman who was present at JPII's visit; fifth and sixth rows, the homilies of the Lutheran pastor and of the Pope are given. The event marks another important step toward the Panreligion dreamed of by the Secret Forces.